Our Richmond Townhouse is a spacious and comfortable home in San Francisco's Richmond District. The home is located in a quiet neighborhood that still has a number nearby amentieis that make the home really attrractive. The very pleasant home is highlighted by a large kitchen and dining area. The living room offers a large TV and great gathering spot. The bedrooms are both large and the master has an en suite master bath. The home is very bright. The excellent dining and shopping district along Balboa is a short walk from the Townhouse. 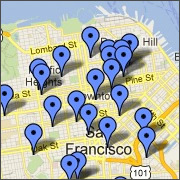 There are also numerous opportunities for dining, shopping, and nightlife along Geary. Public transportation is nearby. Make your next stay a great one at our Richmond Townhouse.